Holiday baking has officially commenced folks! I needed a short break after my Thanksgiving Pie-making bonanza to just breathe and reboot, but here I am with lots of ideas and excitement for December! 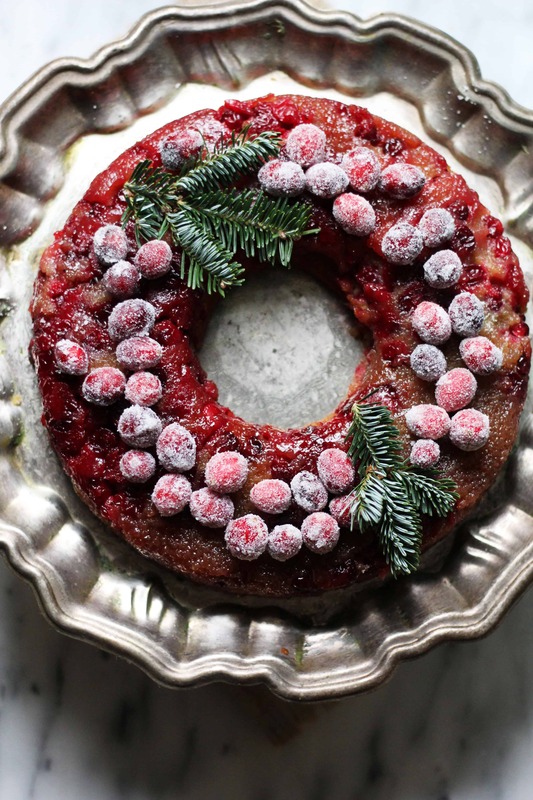 I am starting the month out with super festive and delicious cake that would be a sure showstopper for any holiday spread. It’s also actually quite easy to throw together which makes it even more wonderful. 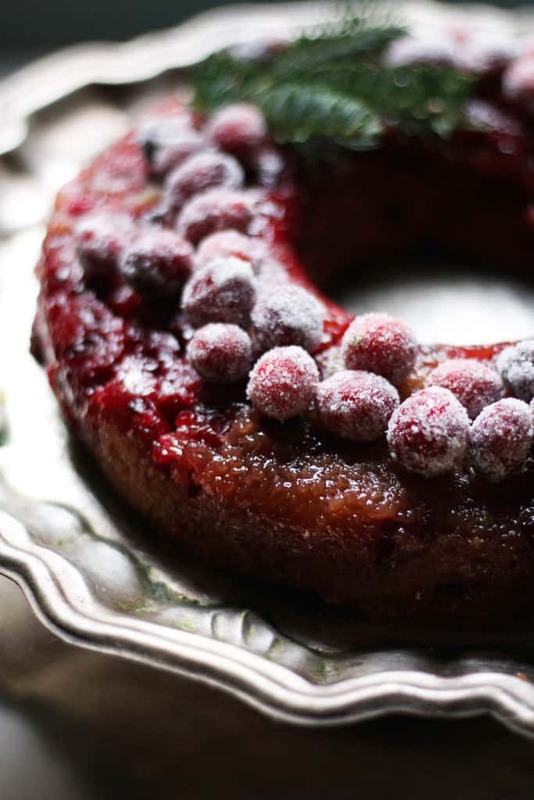 Fresh cranberries are tossed with melted butter, cinnamon and sugar and then placed into the bottom of your cake pan. (I used a ring pan for this but I think a regular cake pan or bundt would work too, more notes on that in the recipe.) Then a simple buttermilk cake batter is poured on top and the whole thing bakes up beautifully. I decided to get fancy and make some sugared cranberries to go on top, (I followed Annie’s recipe to a T,) but they are totally optional. The cake is so incredibly good, with a bit of tang from the berries and a buttery, melt-in-your-mouth texture. I served this to some mom friends with an afternoon cup of tea, but I think it would be a special dessert for just about any festive, wintery gathering. I can imagine the flavor and I imagine it is fantastic! Beautiful and festive! I have it in the oven right now and my kids are making up excuses not to go to sleep so they can taste it when it comes out of the oven :) Just one thing– the ingredient list calls for 2 T of water, but it’s not mentioned when to add it in the directions. I assume it’s with the sugar and cranberries? I’m hoping it doesn’t make much of a difference because I left it out! Many thanks, and happy holidays! This looks gorgeous!!! Stunning even. I made this for Christmas and it was a hit! I had no idea how much I liked cranberries! The only thing that I would’ve done differently is that I had frozen my cranberries, so I actually added them to the butter mix frozen. 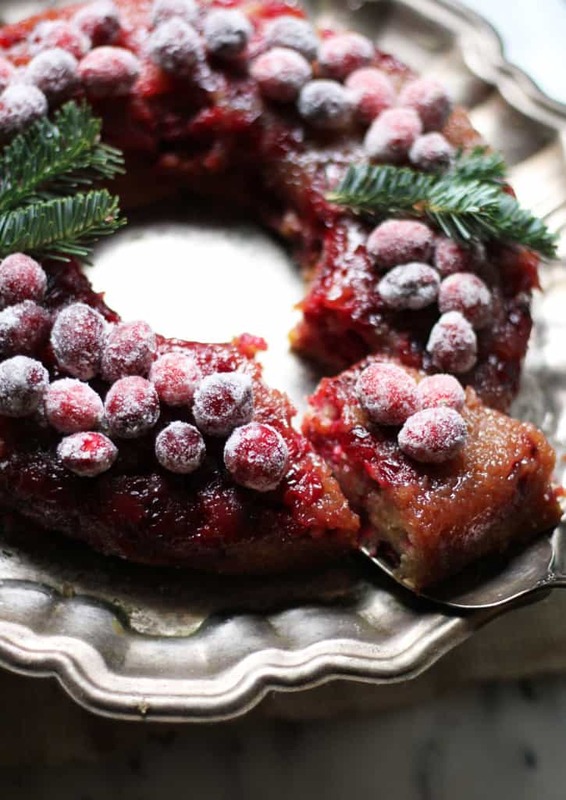 It made it pretty hard to spread in the pan bc it was like a giant butter sugar cranberry popsicle– so if someone out there is using frozen cranberries too– take the time to defrost them for an easier time. It didn’t affect the final result though. Super moist and a perfect sweet and sour balance. Great recipe Audra! Did anyone make this in 2 loaf pans? Thinkingbof trying that, but she says increase the batter if not using an angel food cake pan. Any recommendations on by how much to increase? Thanks for your help!